In March 2009, Ernesto Perez-Carrillo ended his nine-year tenure with General Cigar. The move effectively made the Artesanos de Miami his last blend with La Gloria Cubana, the brand he built from relative obscurity to industry prominence. Perez-Carrillo parted ways with General to establish his own family-owned boutique. He wasted no time in that endeavor. With a factory in Santiago and a work-in-progress website, the EPC Cigar Co. was up and running in time to debut its first blend at the IPCPR Trade Show that August. Perez-Carrillo evidently appreciated the compliment. Last summer, he debuted a new blend called Original Rebel Maverick (as well as a Broadleaf maduro-wrapped companion line called Original Rebel Rebellious). It sports a pigtail cap, a closed foot, and an oily, clean, medium-brown Ecuadorian wrapper around Nicaraguan binder and filler tobaccos. Three Maverick sizes are available. 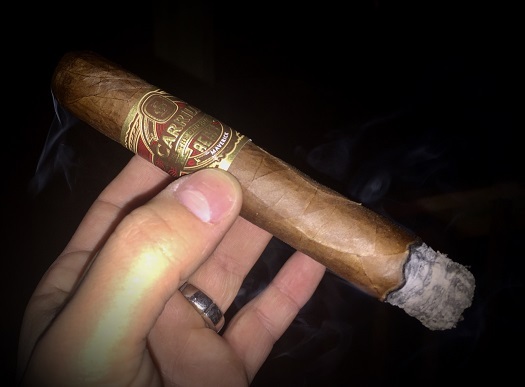 I recently sampled several in the “52” format (5.5 x 52), a robusto extra that retails for about $9. Once lit, pre-light notes of sweet hay and dried fruit transition into a toasty introductory profile of oak, butter, and dry cedar spice. Intermittently, those flavors are accented by a delicious taste that I can only describe as a combination of salted caramel and sweet cream. The effect is one of balance and complexity. I find few changes in flavor or strength from light to nub. At times, notes of leather and some black pepper spice waft in and out, but that’s about it. I don’t consider the consistency in taste a defect, mind you, since the billowy, medium-bodied smoke is satisfying and harmonious. As for construction, the draw is virtually effortless throughout, and the smoke production is above average—a welcome trait since the resting smoke is sweet and aromatic. The ash holds well off the foot. The burn is imperfect though not troublesome; a torch touch-up is necessary here and there to keep the burn line even. If the E.P. Carrillo Original Rebel Maverick blend has thus far flown under your radar, I would suggest springing for a single to take it for a test drive. Don’t be surprised if you find yourself buying a box of ten shortly thereafter. In my book, this fine cigar is worthy of an admirable rating of four stogies out of five. I’ve often smoked and enjoyed EPC cigars in recent years. While I can appreciate the company’s desire to re-fresh and re-brand the product line it’s actually caused me to dismiss it. It feels too much like work to figure out what to smoke. Ted – I agree. From my perspective, the large EPC lineup is too complex and too difficult to easily navigate/remember. Are we consumers expected to memorize (or care about) their pyramid of brands (i.e., Factory, The Classics, Dimension, Elite, Family Series)? Or is this pyramid for EPC retailers and, if so, how does it help them move product? This is a marketing problem, and the fix is simplification. Truthfully, I started to write about this in my review, then realized I was droning on about a subject that probably requires its own article—not to mention the fact that I was missing the point of the review. Branding aside, this is a really nice smoke, and I would recommend you try it.